It's Then Sings My Soul Saturday. I've been listening to this song on my way to work and ...I love it. It's called "Do Everything" by Steven Curtis Chapman. The words have such meaning to me as I pray that I would live this way each day. I'm sure you can add your own scenarios. Just remember to ...do everything you do to the Glory of the One who made you! 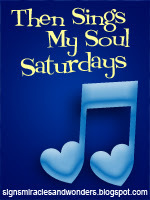 I'm linking up with Amy of Signs, Miracles and Wonders for Then Sings My Soul Saturday. Great song and thoughts. We all need to remember that the little things matter too. I'm so glad it all matters! Great commentary, Debbie, for a great song. It is a great song with such meaningful lyrics because everything we do we should do to the glory of God. It's wonderful that you have been blessed to have a ministry to the little children. I would love your job, even cleaning up after them. They are the Lord's special treasure. I love this song! The verse that it comes from has always been one of my very favorites. I love that the song has such a great message and reminder! I just love this song! It always gives me a smile when it comes on the radio. Great reminder that big or small though our job may seem in our eyes, what God sees is our attitude and how we serve Him. Thanks for sharing. do everything you do to the Glory of the One who made you! --- amen!